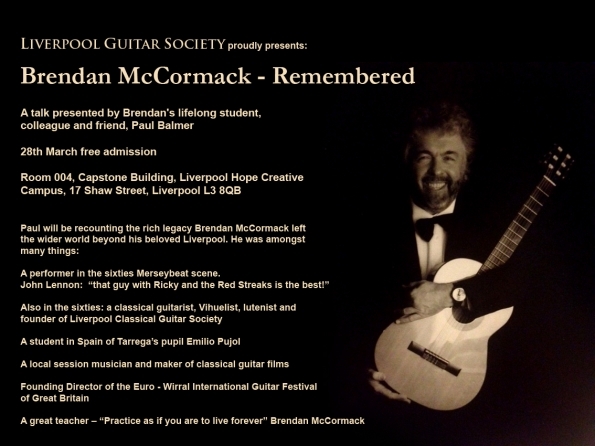 In late March LGS were pleased to be able to present a talk, “The Life of Brendan McCormack.” We invited Paul Balmer, a former student and friend of Brendan’s up to Liverpool to enlighten us on the legacy of one ofLiverpool’s most eminent guitarists, Brendan McCormack. 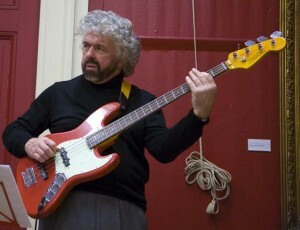 Founding Director of the, Euro – Wirral International Guitar Festival of Great Britain. The talk was due to take place at our usual venue for meetings, however and without our knowledge,Hope University had decided to shut for Easter. This was unprecedented and left us facing an extremely embarrassing situation with members of Brendan’s family arriving at any moment, and Paul having travelled a considerable way bringing a number of old guitars and a lute with him. Whilst we enquired at a number of hotels, one of Brendan’s daughters’ had a contact at the Hope Street Hotel who agreed, for a reasonable fee given the short notice, to act as the venue. Thus we found ourselves in a very posh room and the show could go on. Paul’s talk outlined a chronological history of his friendship with Brendan, from the perspective of a student initially, to that of a collaborator in film projects and a lifelong friend. 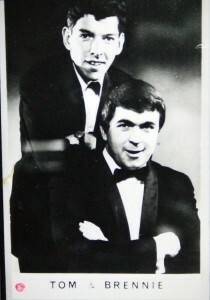 He first met Brendan in 1971, with whom he initially studied guitar and music theory. He continued to know Brendan as both friend and student for the next 38 years. To begin Paul set a relaxed atmosphere by playing a bossa-nova piece, typical of the type Brendan enjoyed. This was played on Brendan’s old Harold Peterson guitar. He then began to set up Brendan’s back story: born on Liverpool’s Scottie Road, he grew up in pub, and in his early teens began to play guitar. 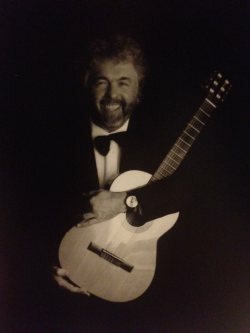 However, Brendan wanted to go further than playing Chuck Berry, so he moved on to studying classical guitar in Manchester with Terry Usher, and one of Manchester’s Guitar Circle’s founders Jack Duarte. Obtaining decent classical guitars in the sixties was difficult. Morris Ashurst, who was another teacher of Brendan’s at time and Len Williams (John William’s Dad) encouraged Harold Peterson to build guitars. An informal discussion on this notable British luthier followed, with some of those present who remembered Brendan reminiscing about this particular guitar! Brendan’s had a cambered fingerboard (this was refurbished in 1977). In 1965 apparently it had a Spruce top, as remembered by members of Chester Guitar Circle who were at the talk and who were then members of Liverpool Classical Guitar Society. In the sixties Brendan taught guitar and music at Ethel Wormald College. There were tales of him being woken up there by the caretaker! Paul recalled that a particular attribute of Brendan’s was to go to the source, so as to seriously learn and understand a subject. This is something he would always encourage in his pupils. To illustrate this, Paul described how Brendan’s interest in Tarrega (inspired by old 78’s of Segovia’s rendition of Recuerdos de Alhahmbra) led him to travel to Spain to attend a summer school with one of Tarrega’s surviving pupils’ Emilio Pujol. 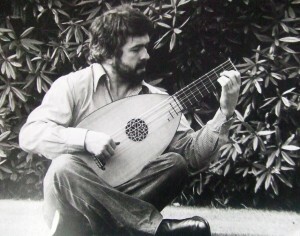 Similarly, inspired by Julian Bream’s lute playing Brendan had to get his hands on one. He finally managed to order one from Rushworths. 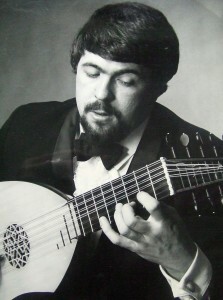 In the late 1960’s Brendan gave lute recitals at Bluecoat chambers in Liverpool. 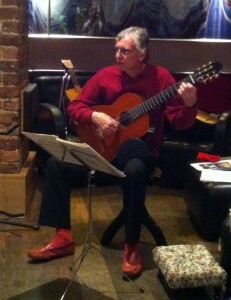 Paul then played a piece by John Dowland on one of Brendan’s lutes. Paul, much earlier whilst sagging off school and going to the Green Moose coffee bar, would see a guitarist there playing ‘Three Blind Mice in a huge array of musical styles. He then realised that this guitarist was now his teacher and assigning him his first task of sight reading ‘Three Blind Mice’. Paul progressed onto Sor studies (e.g Bm, No. 5), learning from Brendan the concepts of free and rest stokes and slurs. Jack Duarte’s technique book was present but considered boring, with Paul encouraged to learn to use slurs in an actual piece. Students were encouraged to engage with the repertoire, with ‘real music’, often using two part inventions on themes by Mozart, Bartok, or Bach to ‘get to the source’. As a teacher, Brendan’s knowledge was huge, across a whole range of genres. He would be able to explain to his students the context of each piece and would explain their contexts and facts from the composer’s lives. He knew the pieces too. When Paul explained an interest in Villa Lobas Brendan proceeded to play every piece by Villa Lobos for solo guitar. This reflected his focus on going to the source. When learning the lute, Brendan made sure he could play all of the Dowland pieces. Similarly he had a keen understanding of Bach and had a library full of compositions for the Vihuela. In 1973 Brendan sent Paul off to see Andreas Segovia at Lancaster University where the maestro was being awarded an honorary Doctorate. Brendan knew the head of faculty there and pulled strings! Similar arrangements enabled Paul to meet John Williams. Paul wanted to be a session guitarist, but this desire was curtailed by an accident to his hand. Instead he turned to sound engineering and was employed by the BBC away from Liverpool. Remaining inspired by Brendan and the principle to go to the source, Paul has gone on to write eleven books on the guitar and produce a number of feature length films. Brendan was, he recalled, always there as a mentor, available on the phone when needed. When Brendan set up the Wirral’s International Guitar Festival of Great Britain, an audacious plan to say the least, his brazen approach led to many very high profile names in the Guitar world (and not just classical players) travelling from far and wide to play in the, not so glamorous locations of, Birkenhead and New Brighton (“If you don’t ask, you don’t get”, recalled Brendan’s daughter Anna from the audience!). These connections helped Paul in later years when he was writing a book on the electric guitar. Brendan suggested that he get Les Paul to write the forword, and then proceeded to give Paul his phone number in the States! Les Paul agreed to do it!. 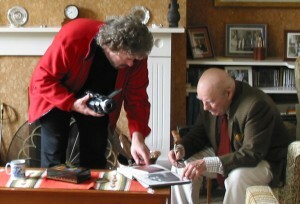 In later years Paul, as a film producer worked with Brendan in producing an incredible film on the life of Britain’s most famous classical guitarist Julian Bream. The filming was wrought with difficulties. Julian was suffering from a foot injury; money ran out towards the end requiring Paul to act as camera man as well as director. Brendan’s role as musical director required negotiation with Bream over which pieces should be included, and Bream himself was a player responsible for persuading Britten, Tippett, Walton, Arnold, Berkeley, Henze, Brouwer, Takemitsu etc. to compose for the classical guitar. The result is a master piece, containing over three hours of interviews and performances; it has been described by Graham Wade as, “the finest film contribution ever to the classic guitar.” and became “Gramophone DVD of the year”. It is available to buy from web sources though sadly Paul no longer receives royalties for this. Further collaborative videos followed: one on John Duarte and a film on Tarrega featuring another friend of Brendan’s, Stanley Yates performing pieces by the Spanish composer. Paul brought the talk to a close describing the last concert Brendan played in, in which he played bass guitar, a throwback to days in the seventies when he would perform with the double bass in concerts at Liverpool’s Philharmonic Hall. Paul answered a number of questions on Brendan and we also looked through copies of Paul’s books, set lists from Liverpool Classical Guitar Society concerts from the late sixties and some photos from Brendan’s life. It was an honour to have had the opportunity to present this talk, and despite the calamity surrounding the sudden venue change, the relaxed atmosphere in the downstairs lounge of the hotel was perhaps more fitting than the normal classroom at Hope University. It was great to have a range of Brendan’s friends and family there along with people from today’s Chester Guitar Circle, who were once part of the former 60’s Liverpool Classical Guitar Society. And of course it was great to have members of today’s Liverpool Guitar Society, some of whom knew and some of whom didn’t know of this important figure in Liverpool’s rich musical history. Thanks so much for this memoir of Brendan. I first met him in the Green Moose in about 1964. He was a brilliant guitarist and a lovely guy. He gave me a book of Arthur Waley’s poems translated from the Chinese when he saw I was reading a book of Japanese poetry and later gave me the Pisan Cantos of Ezra Pound. What a pity he has gone but he was a brilliantly talented and funny guy. The Green Moose was teeming with talent and served as a hub for people with interests in many different art forms to meet. But mainly it was a mad place of continual jokes and one liners which you had somehow to keep up with. The music and song was its heart though, and it was all live, and provided by young and brilliant people like dear Brendan McCormack. I remember when he got that first lute and it was the first I had ever seen. He played it in the tiny coffee bar to hushed amazement. I still have the books and remember the day he gave them to me and the words he spoke as though he was speaking now. Most of us became mature students going from the Moose to University via night school or Ethel Wormauld’s.We were mostly school skivers in the sixties and could not have done homework or stayed away from the Moose. Many of us were lucky to have musicians always around us and lived a lifetime in music and literature which mostly had its roots in the Moose.